BCS National Championship To Be Rebroadcast All Night & Week Long! The Alabama Crimson Tide rolled to an easy win over #1 ranked Notre Dame in the 2013 BCS National Championship game tonight. If you didn’t get enough of the game live and want a replay, ESPNU has you covered. In fact, if you want to, you can watch it again and again…. and again. Blackburn also said the game will re-air on ESPNU again on Wednesday at 4:30 p.m… and that there would be additional re-airs throughout the week. We haven’t been able to confirm it at this point yet, but we suspect the game will also be available online streaming through WatchESPN’s Replay page. We will attempt to confirm that after the end of the game. 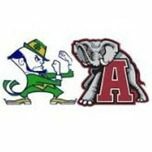 Though there’s no doubt that the Tide had little trouble handling the Fighting Irish tonight – there are still some plays and referee calls that will be interesting to take a look at a second time. Not to mention the shove between the Alabama Center and Quarterback! What parts of the game are you most interested in watching again? Leave your comments below! When will the game be rebroadcast?